Product #17407 | SKU LP36413 | 0.0 (no ratings yet) Thanks for your rating! The mica Photo Traveller 150 Backpack from Lowepro is a moderately priced backpack that holds more than its weight in gear. It's rated to hold a compact DSLR such as a Canon T3i with an 18-200 lens attached as well as 2-3 additional small lenses such as a 70-300mm f/3.5-5.6 and 50mm f/1.8 plus a flash and some accessories. Or, if you prefer a compact or mirrorless system, it will accommodate that plus up to 3 small lenses. There's also a dedicated, padded pocket for your iPad. 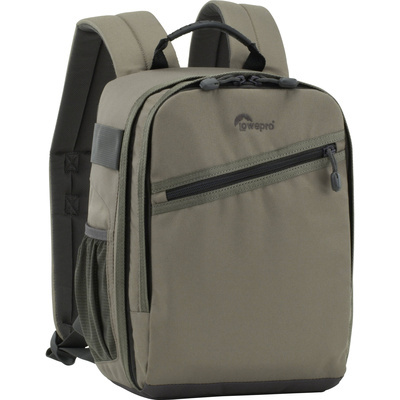 The Photo Traveller 150 is carried by its padded, adjustable and contoured shoulder straps. The backpad, like the shoulder straps, is also padded for maximum comfort. It also has a quick-grab top handle for rapid retrieval from your car or closet. FAA and airline carry-on specifications are subject to change without notice, please cheque with your airline before designating this case as a carry-on item. Most airlines require carry-on items to have an external linear measurement that is equal to or less than 114.3 cm. The external dimensions of this case add up to 75.4 cm.